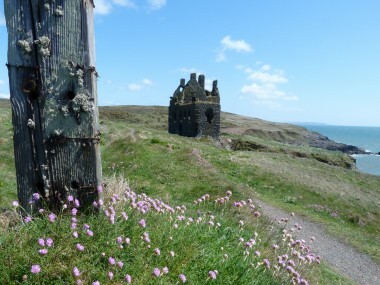 Dunskey Castle is a magical place, close to Portpatrick and this is one of our favourite walks. The total distance is just under three miles round trip. At the War Memorial, go right for a short distance then first left (signposted for caravan parks). The road ascends quite steeply at first then levels off. At time of writing, (April2016) a new bar/restaurant/coffee shop “The Galloway” is about to open at Galloway Point. 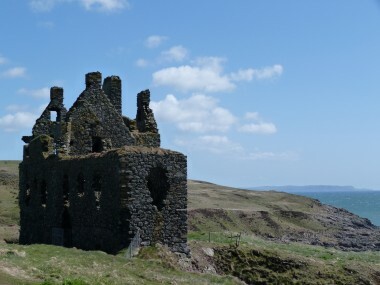 After passing under the three arched former railway bridge (the Port Line or Portpatrick and Wigtownshire Joint Railway ran from 1861 to 1965) walk through Castlebay Holiday Park keeping to the main driveway from which you will get your first glimpses of Dunskey Castle. Head for the right hand corner of Castlebay, through a gate to join the coastal footpath and head for Dunskey Castle a short distance ahead. The view opens out here and on a clear day you can see a wonderful panorama including the South Rhins Peninsula towards the Mull of Galloway, The Isle of Man, the Mountains of Mourne and Northern Ireland. Descend slightly to Dunskey Castle, built on a cliff-top promontory and marvel at its majestic ruins dating back to the 12th Century. From Dunskey Castle, a good footpath leads back along the cliff path. After a short distance, the path forms a ridge between the sea on one side and a railway cutting on the other. Cross a sturdy wooden bridge- Taylor`s Peak Bridge over a rocky inlet and marvel at the rocks below where nesting sea birds can be seen in the spring. The path is festooned with beautiful wild flowers in Spring and Summer. Enjoy the aerial view of Portpatrick Harbour and Village before descending a flight of about 140 steps (this is why we do the walk this way round) and return along the harbour side. To return to Rickwood House, you can either carry on to the end of the harbour area where more steps lead up to the cliff top, then rejoin Heugh Road by cutting through the Portpatrick Hotel car park or return by the “Lovers Lane” steps at the far corner of the Putting Green. Dunskey Castle near Portpatrick a great walk from Rickwood House B&B. 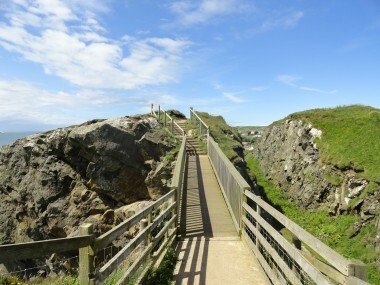 The path crosses Taylor`s Peak Bridge above the old Portpatrick Railway line.